It’s come to our attention that we’ve never actually wrote a post like this. Sure you see videos of people doing this but we thought we’d try and put it into words for all you guys/girls. Grips are one of those things that are really easy to take off and put on but many people don’t know the trick to it because they’ve never been told. If you want to learn how to take off grips/bar ends and put them back on, continue to read this post. It’s most likely that you’ve gotten new grips and want to remove your old ones to install the new ones, so we’ll start with the removal piece first. The first thing you have to do is take off your old bar ends (if you have any). What you want to do is grip the bar end very tightly with your hand and rotate it counter clockwise as you pull up on it. This will allow the bar end to slide up with ease. If the bar end won’t budge you’re going to want to replace your hand with a wrench and really squeeze that bar end as you pull it up. Once you’ve got those out its time to remove your old worn down grips. If you have an air compressor, removing grips and putting them on is nothing for you but were going to focus on the much more common way: hairspray. You’re going to want to find your moms old hairspray bottle and begin to pull back the grips (you can use a flat head screw driver to shove down beneath your grip if you want to have a bit bigger opening). Spray a little hairspray under the grips and begin to pull them off the bar as you twist them. Doing this will allow the grips to slide off with ease. To put new grips on is basically the reverse order of taking them off. While the grips are still off the bars, spray a little bit of hairspray in the grips and let them soak for a quick minute. Next, all you have to do is just slide them on the bars while you twist them. They should go on really easy as long as you use a bit of effort and don’t give up. Your grips will have what we refer to as “throttle grip” (basically they just spin back and forth very easy and make it super difficult to ride) for about 12 hours so plan on not riding too hard that day or plan on doing it right before you go to sleep so they will be ready to go when you wake up in the morning. Now that your grips are on, the last thing you need to do is put the bar ends in. Line them up with the logo facing how you like and just take a rubber mallet and hit them until they go in (you can even push them in with your hand if you're strong enough). If you don’t have a rubber mallet you can use some hard concrete to get the job done. Just simply go into the street and treat the concrete like a mallet. We hope this helped you if you were having trouble installing your grips or taking them off. For a video reference of what we just talked about, CLICK HERE! 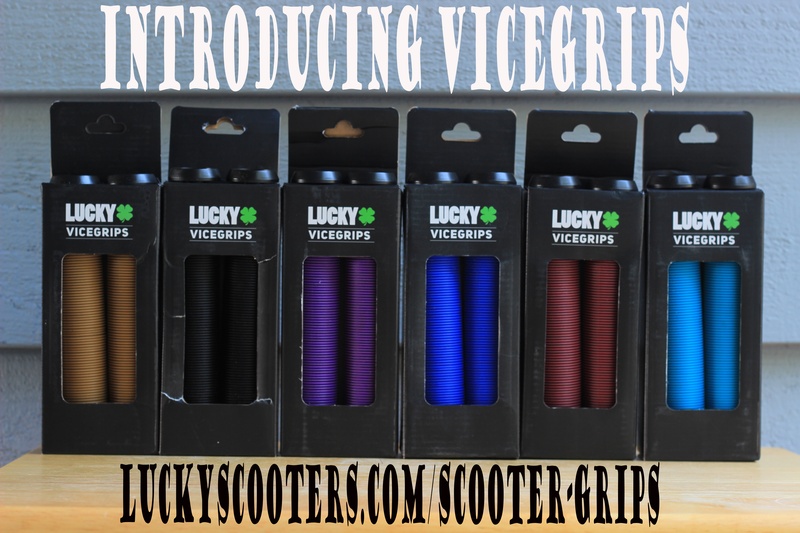 To buy the all new Lucky vicegrips, CLICK HERE!